Looking for a set of headphones that’ll deliver clean, crisp sound, all while cancelling out background noise? 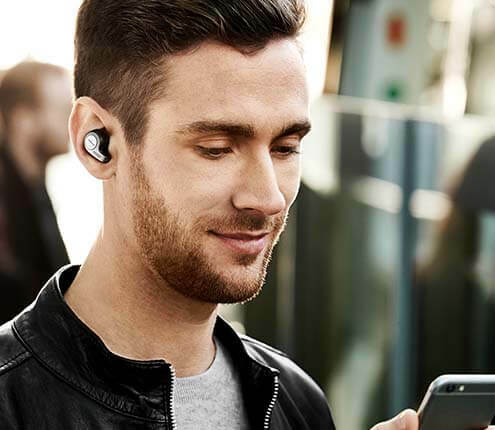 Jabra’s range of in-ear headphones are an excellent choice, offering all this plus great levels of comfort, excellent NFC and Bluetooth connections, and durable builds. Jabra Elite 65t is a third generation true wireless product, experience the stability that lets you take calls and listen to music without worrying about audio dropouts. And with Bluetooth 5.0 you can seamlessly connect the Elite 65t to your smartphone. Whether you’re a constant or occasional headphone user, when it comes to acoustics it’s important not to scrimp. Jabra’s in-ear headphones have been sculpted to provide the best sonic experiences possible, with designs based on professional products used by musicians. In partnering with Dolby, Jabra’s headphones come with an exceptional sound quality, delivered cleanly with the help of the Jabra Sound app. 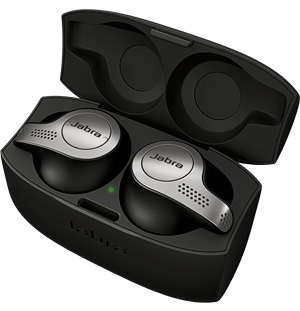 In-ear headphones need to be comfortable, and that’s exactly what you’ll get with a pair from Jabra. With each model coming with ear buds produced from foam and silicon, and in a range of sizes to suit all ears, you can use the headphones safe in the knowledge that they’ll stay put when you’re on the go. For sports users, Jabra’s in-ear headphones are a natural choice. Alongside being produced to not fall out during intense exercise, sports models come with performance tracking sensors for a huge range of variables, including heart rate, steps, calories, VO2 Max and cadence – they don’t just let you listen to music while you train, they coach you. Comprising robust wired and wireless designs with long battery lives, take a look at the Jabra in-ear headphone range today.